Sarah and I were looking for a very simple “How Low Can You Go” recipe that we could actually use for a picnic at the park. 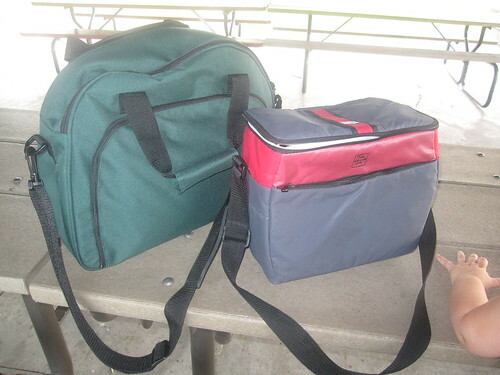 It had to be quite simple, something that could be mostly prepared at home with only minimal prep at the park, and it had to be easy to transport. Prepare rice as directed on box. 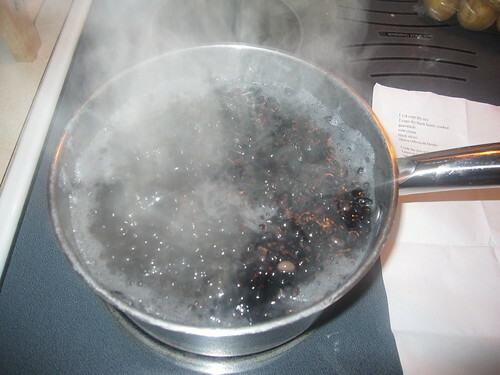 Boil black beans in a small pot. Melt 1 can rotel and velveeta in a small dish in the microwave. If family of 4, bring 4 bowls out to serve individually and lawyer as follows. 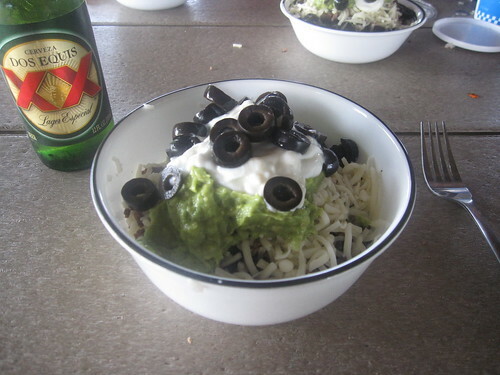 Rice at the bottom, black beans, queso, quacomole, sour cream, olives on top. 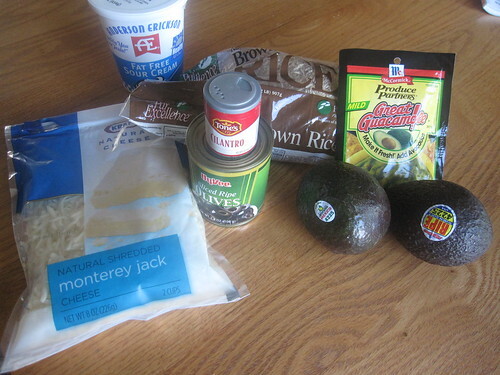 These are all things I love-so I just threw them all together for a yummy and easy meal for my husband and I. We have lots of leftovers! Velveeta? An Archer Farms boxed meal? Hmm… why don’t we just do it from scratch? So that’s what we did. Our guacamole spice packet is just a mix of various herbs that’s really tasty and pretty much everything else is from base ingredients. Since our daughter is a little iron-deficient, we chose to add a little bit of ground beef that we had in the refrigerator to give her a little extra iron. Not a requirement at all, just something we keep an eye on. 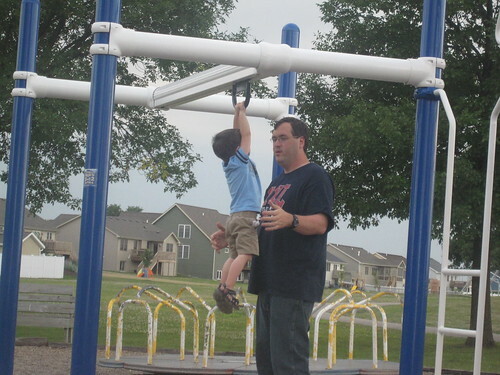 The best part about a picnic at the park is that it can immediately be followed by fun on the playground equipment. Everyone loved it. The bowls were devoured with only a bit of leftovers. It helps that my children love black olives, which made the overall meal seem better than it otherwise would have been. Our cost for this was about $9, without many leftovers. All we wound up with was leftover black beans, which we intended to use in another recipe later on. So, the cost per bowl was about $2.25 – a little high, but it was very easy to prepare, pretty healthy (aside from the sour cream), and portable enough that it could be eaten at a park. Obviously, we weren’t strong fans of the prepackaged original meal, so we modified it big time. Here’s what we did instead, which turned out really well. Cook the black beans according to recipe. Cook the rice according to recipe, replacing half a cup of water with half a cup of lime juice and the cilantro. 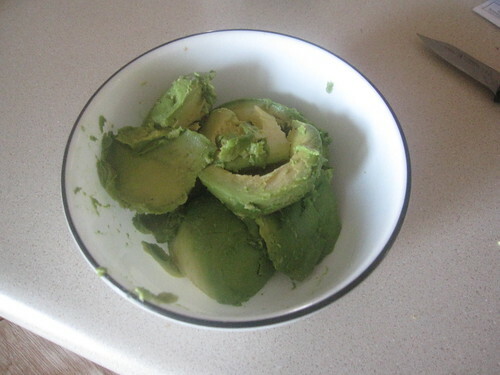 Cut up the avocado, add the salt, garlic, and black pepper, and blend into a paste to make guacamole. 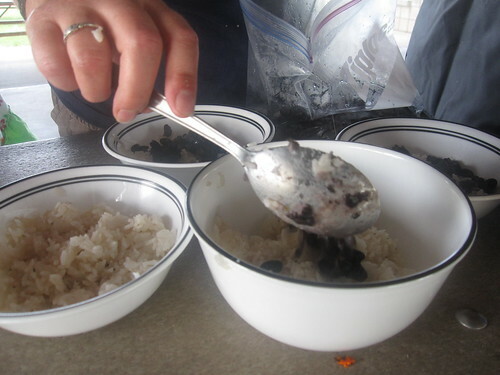 Assemble the bowls, starting with rice, then beans, then cheese, then guacamole, then sour cream, then black olives on top. Enjoy!